The Annual Allegheny Observatory Open House is scheduled for Friday evening the 22nd of September. Guests may obtain tickets for the tour by calling the observatory at 412-321-2400 starting at 9:00a.m. Tuesday morning the 1st of August. There is no cost for the tickets but they are in limited supply and go quickly. Amateur Astronomer Association of Pittsburgh members will volunteer for both inside the building and bring telescopes for outside on the front lawn. AAAP Member volunteers need to login for member information to appear. In the interest of safety the Friday, June 28, 2017 Wagman Star Party has been cancelled. The possibility of flash flooding in the area, especially in nearby Russellton, during the evening hours is the main reason for this decision. Factor in a soggy field and Thunderstorms around our facilities, it was the only choice to we can make. Saturday night’s Wagman Star Party is still on at this 1PM, June 28, 2017 update. See a region of space where stars are being born, catch a dazzling view of Jupiter and see Saturn’s rings in the evening sky. Marvel at our Milky Way Galaxy’s finest planetary nebulae and star clusters and more with the Amateur Astronomers Association of Pittsburgh at the AAAP’s Wagman Observatory July 28 and 29 Star Parties. 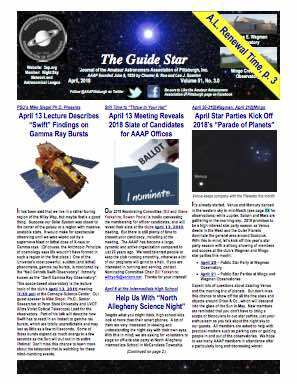 This invitation to amateur astronomers, students and the general public is part of AAAP’s annual series of star parties occurring March – November at the Wagman and Mingo Observatories. There is no charge for these events, although donations are appreciated. Read more about Star Parties here. These July 28 & 29, 2017 Wagman Star Parties create an opportunity to view the July sky: Jupiter and several of its moons, followed by Saturn, its rings and some of its moons, the dazzling Hercules Cluster, the Ring Nebula and much more. With the Great American Eclipse, August 21, 2017 less than a month away these star party nights provide opportunity to learn more by talking with helpfull AAAP volunteer staff. The Pittsburgh Partial Solar Eclipse will be 84%, comparable to a cloud dimming the sun or the amount of daylight at ~7:30 AM or PM that day. Never look directly at the Sun without proper (safe) filtration. Sunglasses are not enough. From anywhere in the Pittsburgh Area that day from about 1:30 PM to 3:30 PM with safe filtration it would be possible to observe the Moon’s shadow pass in front of the Sun. No magnification needed. Safe solar filtration absolutely required to prevent eye damage. Plan Ahead for 2018 Mingo Observatory Star Party Dates: The Star Parties will be held WEATHER PERMITTING. The public should call 724-348-6150 for more information. The Mingo Observatory, owned and operated by the Amateur Astronomers Association of Pittsburgh is located in Mingo Creek County Park, Washington County, Nottingham Twp, PA. Coordinates: Latitude 40.211 degrees N, Longitude 80.020 degrees W. Map and Directions under the About Tab at www.3ap.org . Times: Safe solar observing; 6:30 PM – Night sky observing; approximately 9:00 PM (Weather Permitting for observing). * After dusk using both the 10” D & G Refractor and the 24” Optical Guidance Systems Reflector telescopes, observe the wonders of the night sky. Some objects observed may include views of Jupiter and its moons, Mars and the craters of the Moon. Many deep sky objects may also be observed such as the Ring Nebula and other nebulae, clusters and double stars. * Presentations about current events in astronomy and the Mingo Creek Park night sky will take place in the Richard Y. Haddad Planetarium at various times throughout the night.